Live simply, love generously, care deeply, speak kindly and leave the rest to God! Hooray, the Jack's Chain is in the hoop! 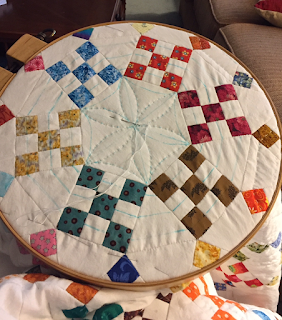 I debated between machine and hand quilting, and hand quilting won out. Primarily because my left wrist and hand are still pretty weak from the break, and I don't think I could tolerate the twisting and turning and pulling this pattern would require on my machine. Besides, since the quilt is entirely pieced by hand, it seems fitting to hand quilt it as well. I am doing big stitch quilting with #8 Perle cotton and thoroughly enjoying the process. Going to the West Virginia State Quilt Festival tomorrow in Summersville, WV. Excited about taking a landscape quilt class from Judy Lily and also seeing all the beautiful West Virginia quilts. 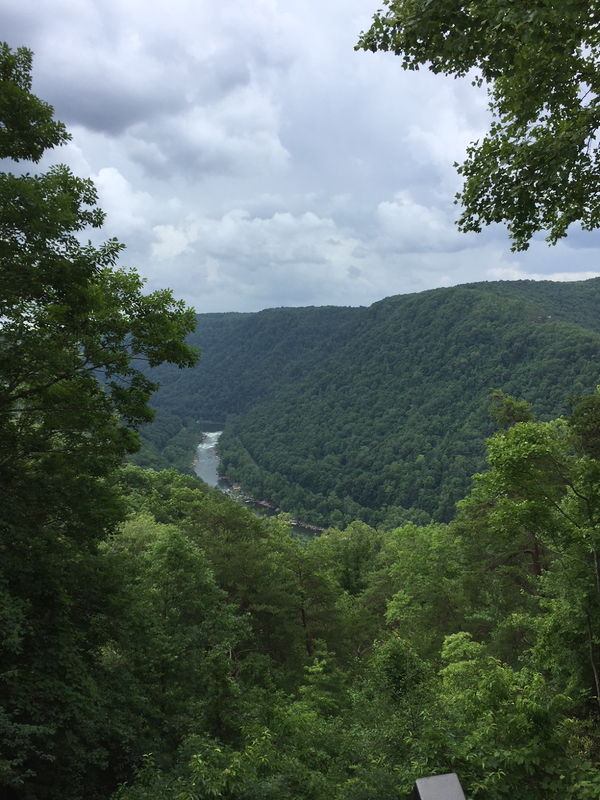 Crossed over the New River Gorge Bridge this afternoon - what a beautiful site. This is a picture of the gorge I took from the visitor's center. Jack's Chain looks beautiful in the hoop! I'm so please you're hand-quilting it -- it SO deserves to be hand -quilted! I like your hand quilting pattern. Works well with the quilt. Cheers!